We decided to hold an impromptu Sunday feast in the park in Vladikavkaz. Many people came and took part in the program. The people of this town are so pious that they seem so innocent like children. Perhaps this is because they are living in such an isolated region of the world and have not become so contaminated by Western civilization. I noticed that they stroll in the streets in the evening without any fear of crime. Boys and girls and men and women chanted and danced without stop in the kirtana , and laughed uncontrollably as we staged plays like “Bird in the Cage” and “The Boatman and the Scholar.” Govinda Maharaja and Sri Prahlada were the sole actors in these plays as I narrated the words and actions with a translator on the side. Our fiinal kirtana lasted hours, and hundreds of people took part. At one point I became exhausted and sat down near the side of the stage where the program was continuing. Somehow word got out that I was a spiritual master in the movement, and many people started coming forward asking for spiritual blessings. A sincere couple, whom I had seen at a previous program, asked that I rename their baby by giving him a spiritual name. 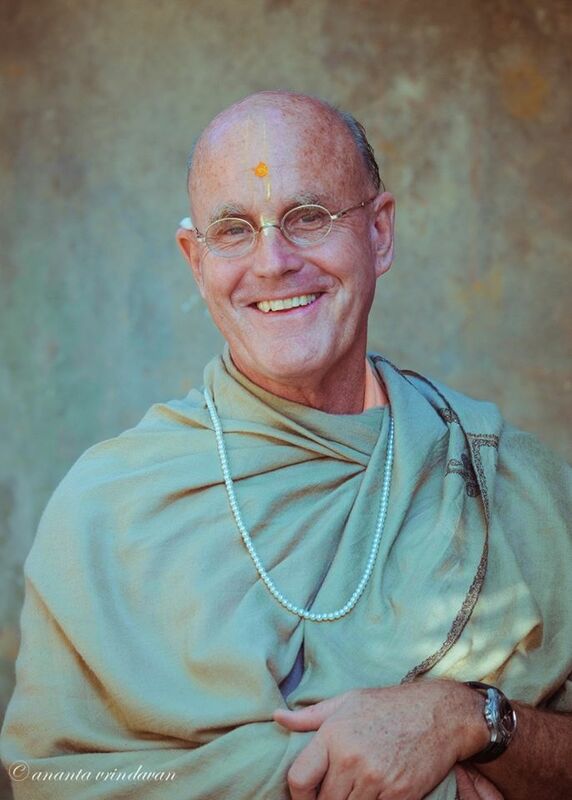 “Call him Krsna dasa,” I half-heartedly said, and before I knew it many couples were lining up for new names for their children. I asked Sri Govinda if they were serious, and he said they were considering it a great honor and would call their children by whatever names I gave them for life. And so it went, one by one they came forward and I gave names like Ganga dasi, Bhima dasa, Krsna Priya, and Radha Kunda. I must have given more than thirty names. Later, as I strolled along the streets near our apartment, finishing my rounds, people came up to me and thanked me for the names I had given their children. Altogether it was an amazing experience.